What is really running on your computer? Is your computer running slower then it used to? Program SleuthTM will show you what is really running on your computer. You'll be able to stop any program that you don't recognize. If a program is gobbling up your computers speed and you don't know what it is, this program will look it up for you. There are hundreds of programs that Program Sleuth recognizes and the list keeps growing. So right from the start you will only see the suspicious ones. Program Sleuth allows you to add known programs to its hidden list, creating a custom “safe” list for your machine. Any new programs that start running on your system are clearly visible. 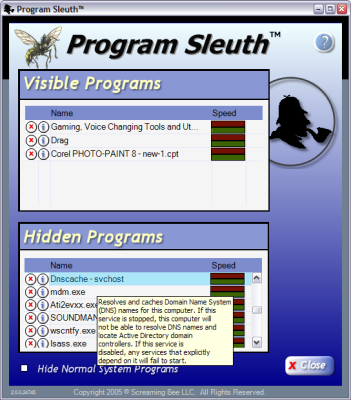 Program Sleuth can look-up new programs to see what they are, and if they are safe to run. You will get full control to find and eliminate problem programs running on your machine, without an annual subscription. You only need to buy it once! Try A FREE Trial Version Today!